Have you been thinking about giving your corporate wellness program a makeover? Check out these five emerging trends for ideas on how to level up your wellness program. A little change can help increase participation and engagement, and get people talking about work, health, and lifestyle habits. Two miles from the office, about a dozen employees showed up, even with the threat of rain. The group hiked a two-mile trail, and talked about work, family, and other interests before calling it a day. More and more companies are encouraging outdoor activities to promote wellness. Take a walk in your neighborhood. Organize a hike at a nearby trail. Plan a picnic or game of Frisbee or kickball. Or level up like Grand & Benedicts, based in Portland, Ore., and offer employees free access to kayaks and bikes to use during lunch hours. Getting outside promotes physical activity. But research shows spending time outside can also help reduce blood pressure, improve mood, and encourage social interaction. Even if you love your job, the typical 9-5 can be a problem for a lot of reasons. Rush hour traffic. Child care. Medical appointments. Car repairs. You get the picture. It’s hard for employees to be present at work and take care of everything else in their life if there isn’t a little flexibility with their schedule. Offering flexible work schedules can have a positive effect on productivity, employee satisfaction, and overall well-being, according to a recent study. It’s another emerging corporate wellness trend that your organization may want to consider. “Our research demonstrates that workers who are allowed to have a voice in the hours and location of their work not only feel better about their jobs, but also less conflicted about their work-to-family balance,” says Dr. Phyllis Moen, who studies organizational work-time policies and practices at the University of Minnesota. Not sure your employees want or need flexible work schedules? Ask them. Send out a survey to get a sense of what employees think about their current work schedule and options for a more flexible schedule. Ever hear employees talk about stress, anxiety, or frustrations about work or life outside the office? It’s real. And left unchecked, it can have a direct impact on morale, productivity, and even lead to health-related problems. But it doesn’t have to. Practicing mindfulness is another emerging corporate wellness trend that more workplaces should embrace. During a recent lunch-hour lecture, Wellsource Director of Health and Research Dr. Joe Raphael walked employees through a series of mindfulness techniques. Controlled breathing, muscle relaxation, focused thoughts. Can adding mindfulness and meditation training to your wellness program make a difference? Research shows that mindfulness can reduce stress, improve mental and physical health, support brain function, and improve performance and well-being. Financial stress is a big problem for a lot of people. And it might be having a bigger impact on your employees than you realize. In a recent survey, 72 percent of adults said they felt stressed about money during the past month. Should you lobby your CEO to give everybody a raise? While that might help some people, helping employees developing financial wellness may be a better investment in the long run. At Wellsource, we recently hosted trainings on end-of-life planning and life insurance. Some companies offer classes on financial management and one-on-one finance counseling sessions. Financial wellness is an emerging corporate wellness trend. The need for this has even led to start-ups like HelloWallet and Enrich to help organizations teach employees about budgeting, saving, investing, and planning for retirement. Be more active. Walk at least 10,000 steps a day. Track your heart rate. Improve sleep habits. These are healthy lifestyle habits you want your population to engage in. And digital technology has made it even easier. Wearable devices like the FitBit practically have a cult following. So do a long list of mobile apps to track physical activity, nutrition, sleep, and help people develop healthy habits. While wearables and mobile apps for health and wellness have been around a while, they’re morphing into more useful tools you can use in your wellness program. For example, software like Apple HealthKit and the Garmin Wellness API allow participants to upload data from mobile apps or wearable devices directly to your wellness platform. A growing number of wellness programs are also using digital technology and fitness-tracking apps to create group challenges, track progress in real time, and promote social media sharing to encourage healthy behaviors. If you’re looking for ways to level up your program, take a look at these emerging corporate wellness trends. Making the effort to keep your population engaged will promote health, increase productivity, and help you build a culture of health. 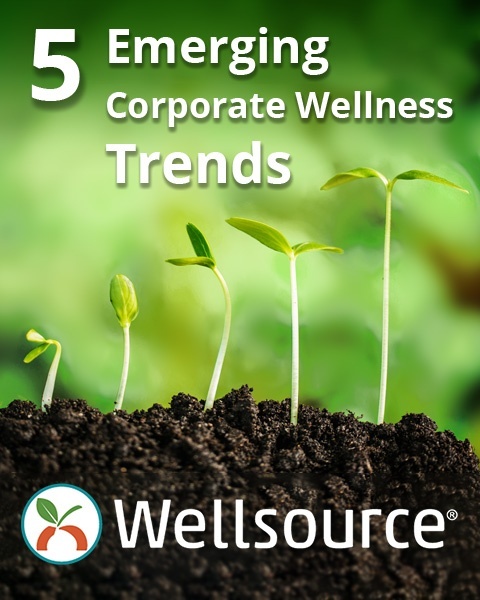 What corporate wellness trends are part of your program? Let us know in the comments below. "Good health is your greatest asset. You will never regret a decision to take better care of your health."